Washington, DC––More than a dozen privacy and civil liberties groups have joined together for an unconventional protest this week, helping Internet users send hundreds of thousands of faxes to the U.S. Senate opposing CISA, the Cyber Information Sharing Act. 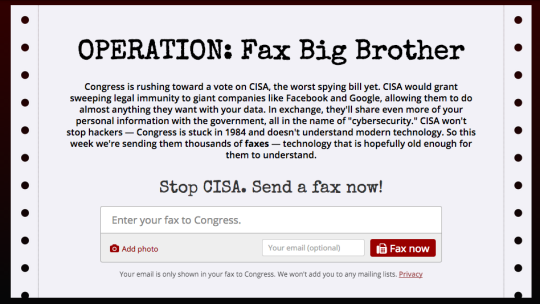 The groups have launched two websites, FaxBigBrother.com and StopCyberSpying.com, which allow concerned members of the public to send a good old-fashioned facsimile to every member of the Senate with just one click. The coalition has also built a tool that automatically turns the contents every tweet with the hashtag #FaxBigBrother into a fax sent to the Senate. The week of action launched yesterday, and already more than 6 MILLION faxes are queued up to flood fax machines on Capitol Hill. Each fax is sent to all 100 members of the Senate. . The week of action, entitled “Operation: Fax Big Brother,” is being organized by Fight for the Future, Access, and the Electronic Frontier Foundation, with support from more than a dozen groups from both the left and the right including the ACLU, American Library Association, National Association of Criminal Defense Lawyers, Freedom of the Press Foundation, Constitution Project. Association of Research Libraries, Niskanen Center, Free Press, The X-Lab, Sunlight Foundation, and Media Alliance. The technology behind the #FaxBigBrother tool was developed by Jeff Lyon. Using a dedicated server and phone lines running out of his attic, the Fax Robot system is capable of continuously flooding Congress with thousands of faxes.